Rhythm guitar – a bad habit? This article originally appeared in Total Guitar magazine issue 220, November 2011. Reproduced by permission. Words: Joe Bennett. Illustration: Noami Hocking. Click the image to download a pdf of the article. This is a songwriting column, and we’re all guitarists. So it stands to reason that we’re writing songs on guitar, doesn’t it? But much as we love our instrument, it may be quietly restricting our creativity. After several years of planning, research, pitching, composing, transcribing and recording, the new Rockschool syllabus was released on 1st May 2012. Here’s one of my contributions – a Led Zeppelin-style rock track, co-written with the estimable Noam Lederman, who also played all the drum parts. In December last year one of pop music’s most famous mysteries was (probably) solved. We now have a reliable and replicable method of playing the Hard Day’s Night chord, courtesy of Randy Bachman. Here’s my summary of his explanation, with added guitar fretboxes. 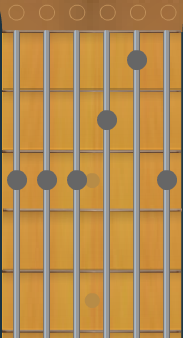 This is a tricky chord to fret, but it can be done, with the thumb over the neck playing the bass note, then the third finger covering the third fret across the fifth and fourth strings, then the rest of the fingers playing one note each. 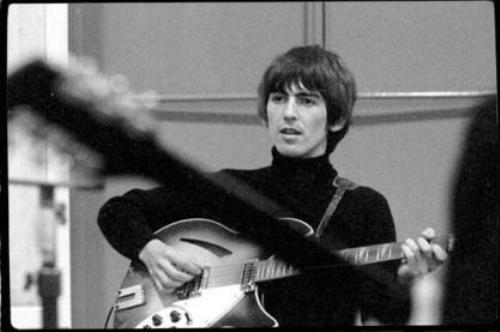 The thumb explanation is pretty plausible – George Harrison is frequently pictured using his thumb to fret notes on the bass E string. 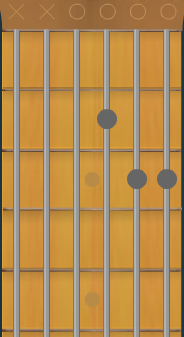 It’s also important to remember that Rickenbacker 12-strings are strung ‘backwards’ in that the high octave strings (E, A, D and G) are underneath their respective low-octave partners in each pair (underneath, ie, nearer to the floor). Rickenbackers are different from every other 12-string guitar in this respect, and this obviously plays a big part of the sound of the Rickenbacker 360-12 – and therefore of the HDN chord. Much simpler – a Dsus4. McCartney plays a D, probably at the 12th fret of the D string. Mystery solved – or is it? We should not discount Dominic Pedler’s assertion that resonant notes from George Martin’s piano may play a part. I am not completely convinced that Harrison would play such a difficult-to-fret chord – I think it is possible that he played just the top four strings of the chord (this is certainly the shape he uses in the outro), leaving the low-end G and C to be supplied by the piano as Pedler suggested. That said, it is hard to deny that Bachman’s live demo of the chord is pretty compelling. I suggest the following two contenders, although the question is pretty irrelevant – giving the chord a name is gratuitous musicological reverse-engineering in which the Beatles would almost certainly not have indulged. This article first appeared in Total Guitar magazine issue 215, June 2011. Words: Joe Bennett. Illustration: Christian Ward. Click picture to download pdf of article. Reproduced by permission. There are no rules in songwriting. It’s your song, and you can do anything you like with it. But! There are principles that occur in a large number of successful songs, and many of the songwriters I teach find these ideas useful when writing new material. They are, in no particular order, Economy, Imagery, Prosody, Universality, Repetition and Originality. Songs use word economy to communicate lyric ideas. The Beatles’ Yesterday tells an entire story of love, loss and regret in 84 words – and 125 seconds (and it holds the record for the most cover versions of any song in history). Many successful songs start with a killer first line that provides lots of information in a few words. When we hear “Stacey’s Mom has got it goin’ on” (Fountains of Wayne) we know (or guess) that the singer is an American teenager, that he is dating a girl called Stacey, that he’s in love with her mother, and that the mum knows nothing about it. Not bad in seven words. Music fans listen with their imagination as well as their ears – and lyric imagery is one of the most useful tools we have in stimulating it. So if you say “I met a girl in a night club” you’re halfway to telling the story, but if you add detail you get “I met her in a club down in old Soho / where you drink champagne and it tastes just like cherry cola” (from the Kinks’ classic Lola – TG205). We see a picture in our minds when we hear this lyric. We also get an inkling of the narrator’s naivety – he’s never been to a bar and doesn’t know why the drinks taste funny. You can write perfectly good lyrics without using imagery, but a few choice visuals can work wonders in helping fans to remember your song. And images can also be used as metaphor. In Biffy Clyro’s God & Satan, when Simon Neil sings “the see-saw snaps and splinters your hand”, he’s talking about life’s balance between good and evil, not about a children’s playground. But if he’d just sung “when your life doesn’t work out as you hoped” the lyric would have been much weaker. Prosody is a catch-all term to describe music and lyric working together to give meaning for the listener. If your chorus says “I Predict A Riot” it’s pretty unlikely that you’re going to accompany it with delicate open-tuned fingerstyle guitar and a tempo of 60 beats per minute – the feeling of the lyric doesn’t go with the music. Conversely, “You never close your eyes any more when I kiss your lips” (from You’ve Lost That Lovin’ Feeling) is such a tender image that you won’t want amps up to 11 and a Screamo vocal. Some songwriters believe that melody and lyric are even more closely related – that positive lyrics go with rising melodies and negative ones with descending melodies. There are plenty of classics that disprove this theory, of course, but again it’s surprising how often you find really successful songs following the ‘rule’. And while we’re at it, have you noticed that the chorus melody is almost always higher-pitched than the verse? It makes people want to join in and tells them that this is the ‘point’ of your lyric. To state the obvious, successful song lyrics appeal to lots of people – this is often described as Universality. It’s no accident that more than 80% of the biggest hits of all time are about love and relationships, because it’s something that all humans relate to. But it’s not all hearts and flowers. Elbow’s One Day Like This suggests that if we can all just feel good about ourselves for one day, we’ll put up with the rest of life’s troubles (and the chorus opens with the wonderful image “throw those curtains wide”). And listen to Lennon’s Imagine – who wouldn’t agree that there should be more love in the world? Repetition! What is it good for? Absolutely everything! Say it again. It might not seem terribly ‘clever’ to simply repeat the title in your chorus, but it’s amazing how well this simple device can work. Perhaps the most difficult part of songwriting is achieving originality. As listeners, we need to hear that quirky extra ingredient – the sound, riff, melody, chord pattern or lyric we haven’t heard before. Over to you. The studio has been busy since its completion. Or rather, its near-completion. Everything is sorted technically so I have 16 simultaneous inputs available, 12 of which have valve pres via the M1F. Howard will be returning soon to fit the XLR wall plates and do the relevant soldering. Remember the holes that Artis drilled for the cables? So in the absence of wall plates I’m just poking XLRs through the holes in the walls (which are now the only route that sound can travel between the rooms – a pretty clear example of how effective the studio’s soundproofing is). 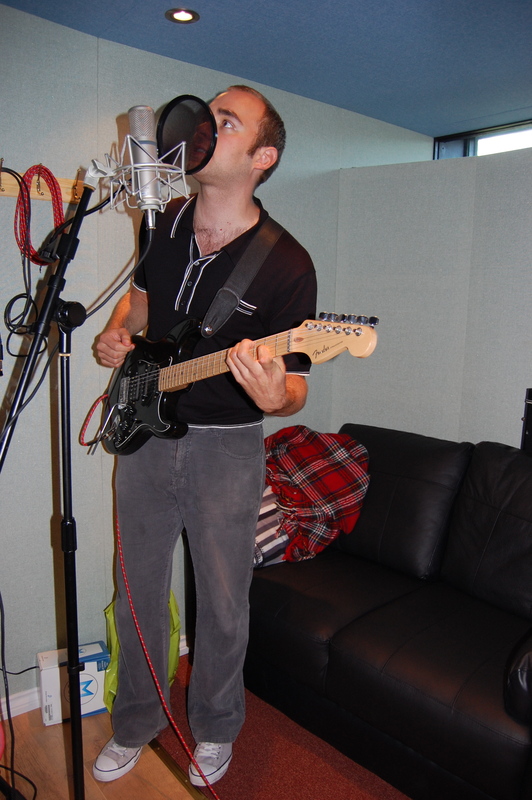 The studio will have three main functions – a recording/co-writing space for commercial song projects and work relating to my Songwriting PhD; a production facility for the CDs that go on the cover of my guitar books (e.g. the next book in the Complete Junior Guitarist series); and, er, everything else – i.e. whatever other musical opportunities arise that sound fun or interesting. In this third category I’ve undertaken three projects recently – a Techno remix of a James Taylor song, a community-based recording of some local people’s original songs, and (mainly to test out multiple drum mic-ing) a prog-rock drum session for a couple of CM graduates, Chris and Tom. The Complete Junior Guitarist was published in Sept 2009 and early indications are that it’s doing OK in the shops. 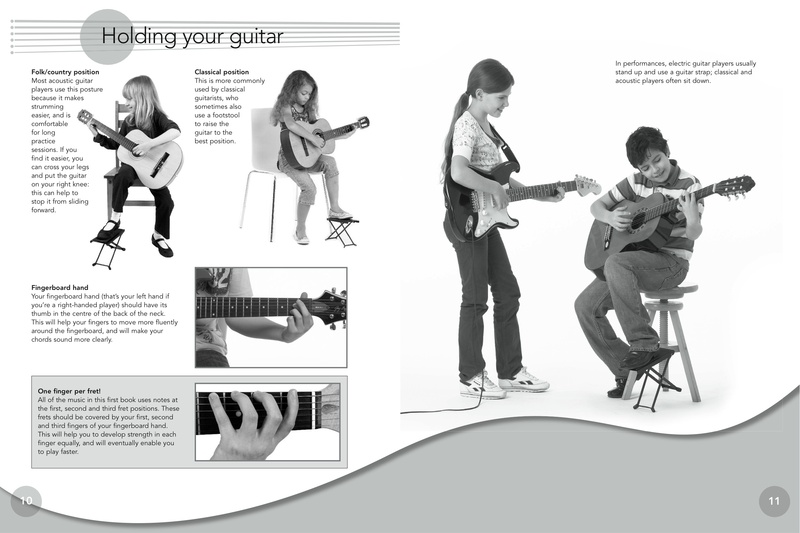 The people at Music Sales tell me that there’s a dearth of good-quality guitar teaching material aimed around ‘Key Stage 2’ (i.e. junior school kids aged 8-11), so this is the book I’ve tried to write – not patronisingly full of pictures of anthropomorphic cartoon animals as younger starter books can be, but not based on particular bands, styles or artists, as more teen-focused books often are. So the book ended up quite ‘serious’ but I think this matter-of-fact editorial tone is what a lot of kids this age like to read. What I’ve avoided (I hope) is ‘dumbing down’ of the audio (there are 52 tracks on the cover CD including backing tracks for all the pieces, and I used live session players for bass and drums rather than compromise by programming the kit part). 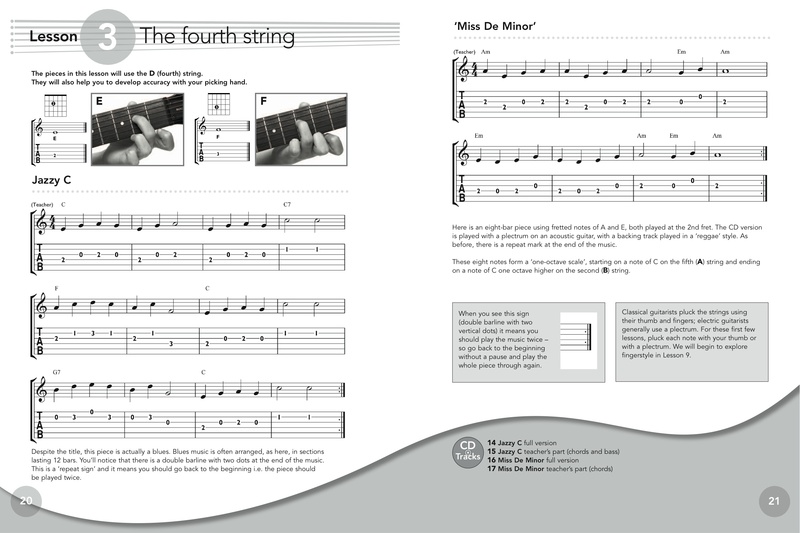 The book also focuses on short melodic pieces, as opposed to chords, which are much more difficult for the beginner – I’ve never understood why some guitar books do this. I’m hoping to write book 2 in the series during 2010, and the home studio will enable me to try out ideas for the next book’s cover CD without worrying about the ‘meter running’ pressures of hired studio space or players’ time (although, as before, there will always be a pro drummer on the final session – I’m not going to be a good enough kit player any time soon). Thanks BTW to everyone who helped me to choose the title for the book (see previous blog entry) – Complete Junior Guitarist won the day, which has the added advantage of making this book the first result when these three words are typed into Google. 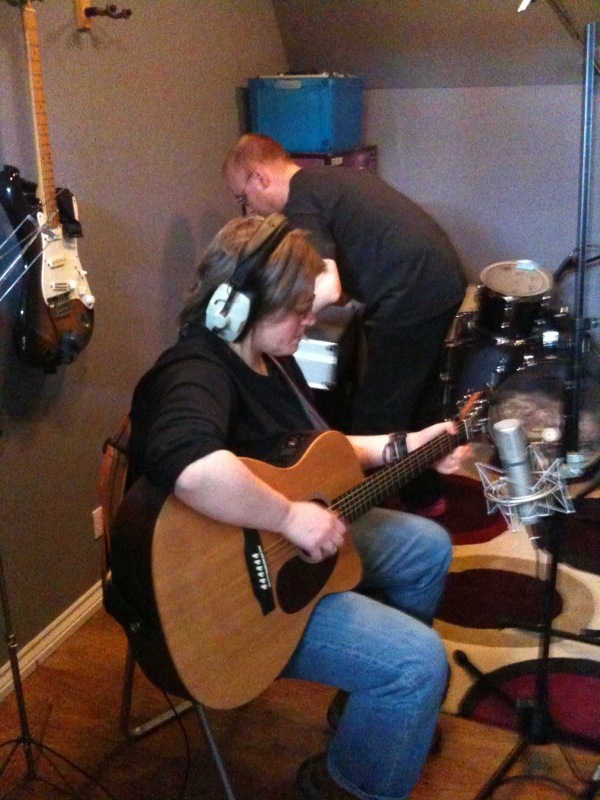 A guitarist mic'd up (with an SE100 condenser) during one of the Widcombe project song sessions. In an earlier post I mentioned the Song For Widcombe community project, and the song I submitted ‘Widcombe Rising’. Since then I’ve gotten to know the lovely people involved in the Widcombe Association and become generally more interested in Mummers‘ plays and songs. The association wants to put together a CD of its top 10 ‘finalist’ songs, and I listened to some of the original demos, which were varying in quality depending on the kind of recording kit each songwriter had access to (some only existing in sheet music form). Given my views on Performance vs Songwriting, it seemed only fair that none of the other songs on the album should be compromised by a technically poor demo – so I agreed to run some studio sessions for those writers who didn’t have access to decent recording kit. The motive for this wasn’t entirely altruistic – I need to test the studio as much as possible to check the signal paths and get to know the patchbay, layout, ergonomics etc… plus the sound of the room, mics & speakers. And given the varied collection of instruments that Mummers’ songs may include (concertina, fiddle, melodion/accordion, piano, recorder, flute, piccolo, bass drum, bodhrán, guitar, upright bass, banjo, and multiple male and female voices) this was the perfect opportunity. Here are a few descriptions of the ensembles we’ve done already – there’ll be a playback session of these and others in Widcombe in a couple of weeks. I won’t post MP3s for now, as I don’t have permission from the writers to do so, but hopefully this will be forthcoming once the project is over; you may also be able to download the tracks from iTunes at some point in the future. 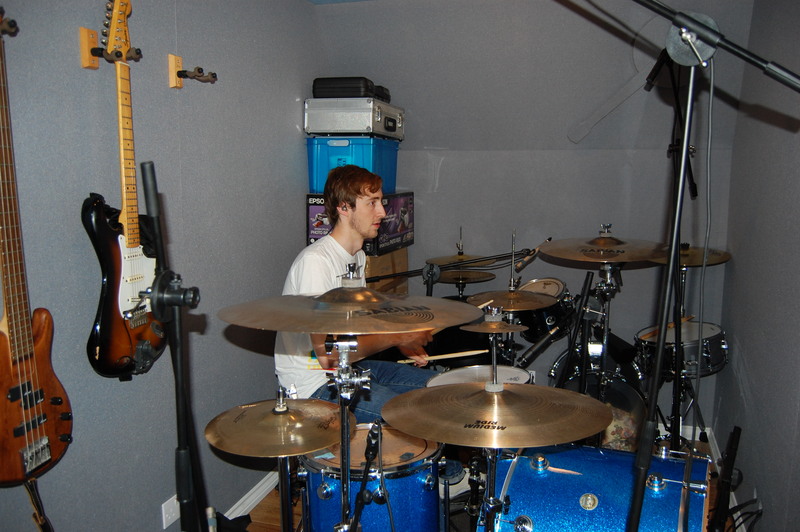 Tom does some drum tracking in the dry room. An unusual drummer - no rack toms, and two hi-hats. Chris puts down a vocal and guitar take in the control room. Finally, here’s a mix of a track I did a couple of weeks ago with a old mate from my days at Future Publishing. He’s a fan of classic Techno (and knows much more about it that I do) but has always had a soft spot for James Taylor (the songwriter, not the jazzer). So here’s our remix-in-progress of JT’s Shower The People (You Love With Love). It’s turned out a little more ’70s Disco than ’90s Techno – I blame the off-beat handclaps on the intro. The track is, of course, doomed to unreleased commercial obscurity, considering its obvious and constant use of uncleared samples of a well-known recording, but hey – it was fun. And James – if you’re reading this, hope you forgive us for timestretching you up to 130BPM. My next book, the ‘Complete Junior Guitar Player’ is nearing completion – I’m at the final stage of proofing now, and expect to see it in print sometime in June. It’s aimed at 8-12 year old children (and guitar teachers in schools who work with this age group), and I’ve tried to create a basic beginner method that sails halfway between the classical and rock traditions of guitar teaching. This is a slightly different approach from some of my more facetious books – it all uses really straightforward language and a step-by-step, systematic method. Here’s a sneak preview of a couple of pages (and yes – I know one of the footstool photos is wrong!). The book will be available on Amazon and Musicroom soon. There is some dispute about the title, it being planned for sale in the UK and USA, and in translation. We need a title that isn’t condescending to children, that appeals equally to children and guitar teachers, is easy to remember, makes it clear that it’s a beginner level children’s book, and looks snappy/clear on the cover. Here’s the poll – vote now!